If you’re a fan of Mega Man X, the newly-released Mega Man X Legacy Collections are a must buy. More than simply a bundle of old games, these collections offer a dive into the history of one of Capcom’s most iconic characters with a repository of trivia and artwork. 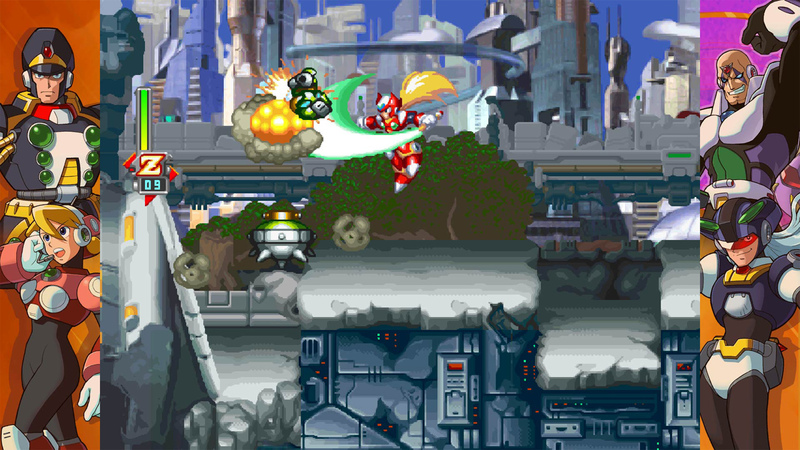 The original games are emulated to perfection, while a brand new X Challenge mode will challenge even the most accomplished Mega Man X players with remixed two-on-one fa fights. For everyone else, though, these collections are a tougher sell. The original Mega Man X was groundbreaking in its day, but—this is going to be a controversial statement—it hasn’t aged well at all, and its sequels don’t fair much better. Even with an optional “Rookie Hunter” easy mode, outdated design philosophies make them arduous to play if you don’t have the benefit of nostalgia to carry you through. But like I said, for people who grew up on Mega Man X—who the are clearly the target audience—the Mega Man X Legacy Collections are a treat. Between the two of them, all eight main games in X sub-series are covered. For most, Legacy Collection 1 will be the main draw, since it includes the beloved Super Nintendo games that spawned the whole Mega Man X brand. 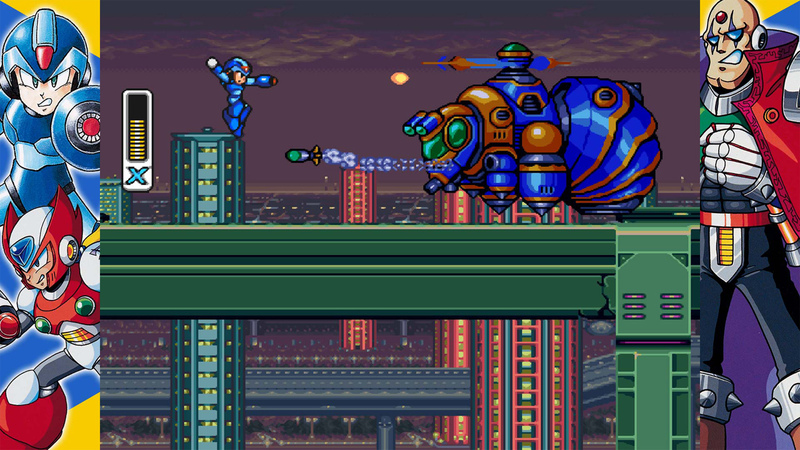 When it first came out in 1993, Mega Man X changed the way people thought about action platformers. With his dashes and wall jumps, X sported a level of mobility that was nigh unheard of, and such mechanics are now commonplace in platformers. 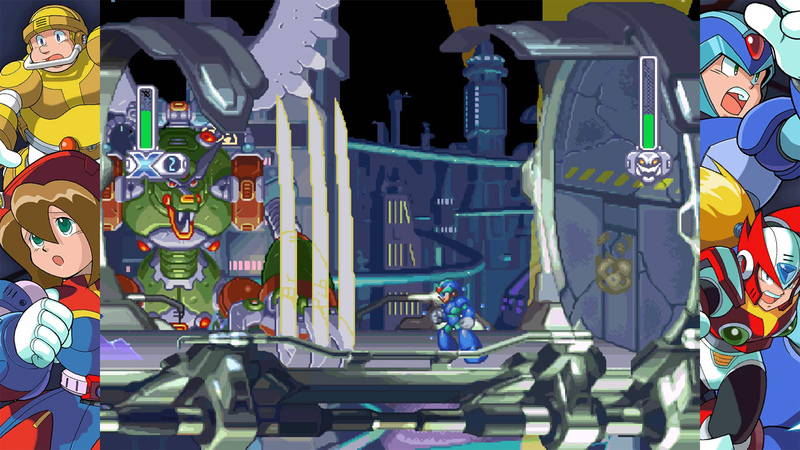 The original Mega Man games let players choose the order they tackled the different stages; Mega Man X built on that by having subtle changes in level design based on which ones had been completed prior. Mega Man X2 and Mega Man X3, released in 1994 and 1995 respectively, stuck close to that format, to great effect. Mega Man X Legacy Collection 1 delivers perfect ports of all three of those games, and they look as beautiful as ever on the Switch screen. The original pixel graphics scale up to the higher resolutions without losing any of their integrity, and there’s the option of old TV-style scanlines or a very nice smoothing filter. I’m a pixel art purist, but the filter looks good enough that I found myself using it more than the original—it’s clean and crisp, with none of the blurriness that you often get with such filters. Collection 1 also includes Mega Man X4, which may not be as iconic as the SNES games but is still noteworthy for carrying the series to a new generation. It was X’s PlayStation debut, and while it stuck to the series’ 2D roots, the more powerful hardware allowed for more detailed sprites than ever. 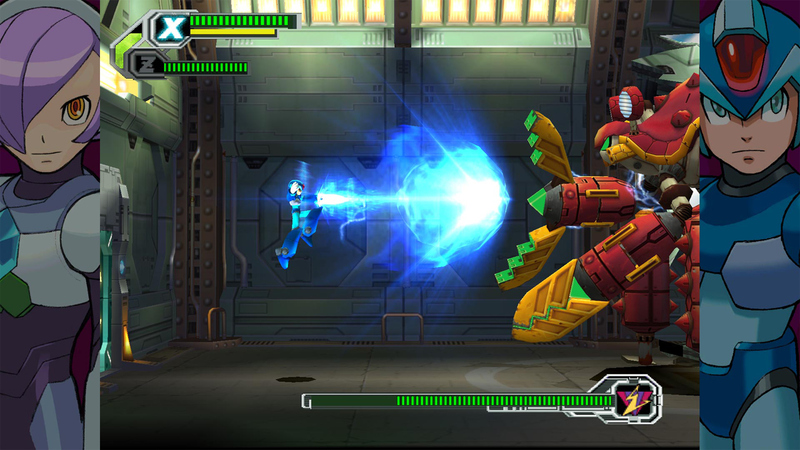 Mega Man X4 was also the first that made Zero playable character from start to finish, offering a very different (and generally easier, for better or worse) style of play to X.
Mega Man X Legacy Collection 2 covers X’s rockier later years, from X5—which was meant to be the finale—through the widely panned X6 and X7, to the first and last Mega Man X PlayStation 2 game in Mega Man X8. Though these games fall far short of the original SNES trilogy in the minds of fans, they nonetheless round out the series, and X5 and X8 alone make this collection worthwhile. For diehard Mega Man fans who’ve mastered the original games, both collections offer up new trials in the form of X Challenges. Each of these pits the player against a pair of bosses, usually from different games and always with a mind to how their different attack patterns might combine to create exciting new encounters. 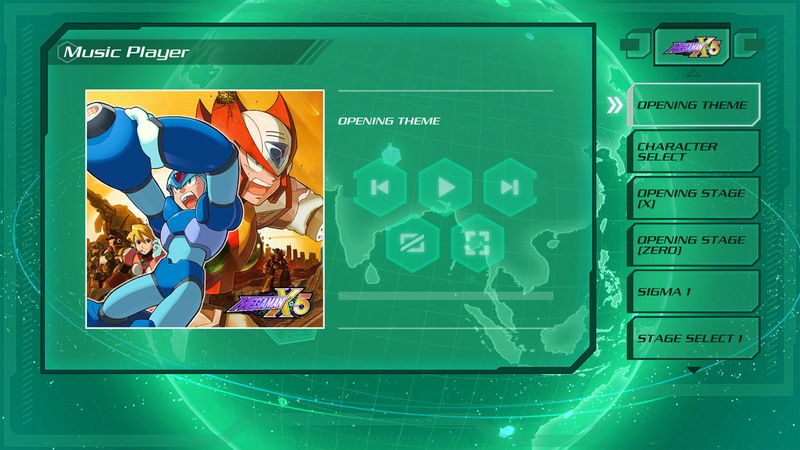 It’s great to see that Capcom isn’t just banking on nostalgia alone, and X Challenge is a great way to introduce something new without derailing the classics. Like all of these sort of retro game packages, The Mega Man X Legacy Collections also serve as a great way to experience a slice of gaming history. As well as a convenient way to play games made for consoles long out of production, the included Museum modes collect a wealth of trivia about each game, as well as concept art, trailers, music, photos of the merchandise, and the like. It won’t be of interest to everyone, but for anyone with an interest in the history of games, it’s fascinating to peruse. While the historian in me loves having such convenient access to a bunch of classics, the part of me that just wants to play and enjoy a game finds little but frustration in the Mega Man X Legacy Collections. Iconic though they may be, and groundbreaking though they were in their time, the original Mega Man X games haven’t aged well at all—yes, I’m going there. Mega Man X exemplifies a lot of common game design principles from the late ’80s and early ’90s that have, rightfully, fallen out of favour in the years since. Most of the difficulty in the early X games comes from enemies appearing suddenly and without warning, leaving you with little option but to take a hit and make a mental note of that enemy placement for next time. Being successful at Mega Man X depends largely on rote learning and memorising level layouts, which is tedious to say the least. Those frustrations are made worse with stingy checkpoint placement—another common trend in the platformers of yesteryear—creating a loop of playing the same sections of a level over and over again. On top of that, by modern standards, the early Mega Man X games in particular just don’t control well. Sure, in 1993, X’s mobility was unheard of, but today he’s clunky and unwieldy, making even rudimentary platforming puzzles a nightmare to deal with. There’s nothing like falling into a pit over and over again because the character doesn’t jump when I tell him to or land where I’d expect. The Mega Man X Legacy Collections offer some solace with an optional Rookie Hunter mode, which reduces the damage you take, but it’s not really enough to bring the games up to a modern standard. The mode does nothing to help imprecise platforming controls or sparse checkpoints, and even with the added defence, sudden enemy appearances will still kill you through attrition. There are plenty of well-established tools for dealing with difficulty born from archaic game design. Many re-released retro games include the ability to save at any point or rewind at the press of a button—techniques that don’t diminish the challenge of the game itself, but remove the tedium that comes from having to retry something over and over again. Capcom’s own Mega Man Legacy Collection made use of these, so it’s bizarre to me that they’re not included in the Mega Man X collections. Some will argue that that’s how these games “should be”, and that players should just get better. Indeed, the Mega Man X are far easier than the original Mega Man series. For people who relish the challenge of “NES hard” games, that’s fine, and these collections make reliving that an option. But for everyone else—who maybe hasn’t played Mega Man X in its heyday, and wants to see what all the fuss is about—the outmoded difficulty makes these collections hard to recommend. If you’re one of the many people who have fond memories of playing Mega Man X back in its day, you’ll find that the Mega Man X Legacy Collections give you everything you could want: a chance to relive those memories, along with creative new boss rush mode. Anyone with an interest in video game history will find perfect ports of iconic games, as well as a Museum mode chock full of trivia, art, and photos. But if nostalgia or historical curiosity doesn’t drive you, these collections have little to offer. The Mega Man X games haven’t aged well at all, and “Rookie Mode” doesn’t do nearly enough to paint over the series archaic frustrations. Mega Man X Legacy Collection 1 + 2 is developed and published by Capcom. It’s available now for Nintendo Switch (reviewed), PlayStation 4, Xbox One, and PC.